The Russian leadership is decided: serial assembly of IL-76 will be moved to Russia. These military transport planes are assembled in Tashkent nowadays, by the Aircraft Manufacturer named after Valery Chkalov, and have been for the last 30 years. At least 1,000 planes of various modifications were assembled in Tashkent. Disintegration of the USSR doomed the Tashkent factory - along with all of the aircraft assembly industry of the former Soviet Union. Two dozens planes at best were made in Tashkent between 1991 and 2006. The Tashkent factory is past recovery now, the fact that finally persuaded the government of Russia to take over the IL-76 production. Prime Minister Mikhail Fradkov signed the appropriate resolution on December 20, 2006. The decision would have made front lines in tabloids but for the end of the year when its importance was unappreciated and the resolution itself was all but neglected by Russian media outlets. Moreover, paperwork is not over yet. There is an IL-76 contract with the People's Republic of China to be fulfilled,, and the Tashkent factory is recognized in it as the parent enterprise. Rosoboroneksport and China signed the contract for 34 IL-76MD military transport planes and four IL-78 flying tankers in September 2005. Experts estimate the deal at $1.45 billion. Now that the government passed the resolution and Industry and Energy Ministry signed a contract with Ilyushin Aircraft Company on December 25, 2006, it is Ilyushin that is in charge of the Chinese contract. Rosoboroneksport intends to sign a special accord contract with it. What information was available at one point indicated that it might be signed in January 2007, but no such reports were made that month. Absence of the accord in the meantime interferes with contract fulfillment. Beijing expects the first military-transport planes from Russia in 2007. A formal excuse for replacing the parent enterprise was provided by the Uzbeks' refusal to sign this accord with Rosoboroneksport even though it was demanded by the Chinese. Conflict between the Tashkent factory and Rosoboroneksport spilled over the borders and became international. Rosoboroneksport in the meantime became so reckless as to refuse reiteration of the contract when Beijing requested it in 2006. In other words, Russia did not formally confirm its obligations to China under the contract. This confirmation requires that Rosoboroneksport and the new parent enterprises, Ilyushin that is, sign the accord. All of that does not mean that the Tashkent factory is about to be chucked aboard right away. Organization of IL-76 assembly in Russia will require finances, resources, and time. It means that the assembly will continue in Uzbekistan a bit longer yet. Contracted by Ilyushin, the factory in Tashkent will assemble 15 planes between 2008 and 2010. 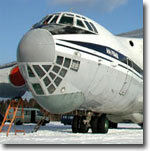 Facilities of Aviastar in Ulianovsk in the meantime will be converted for IL-76 assembly. Serial production of IL-76 in Ulianovsk is expected to begin in 2010. As of 2012, the factory is supposed to up the annual output to ten IL-76MDs and IL-78MFs. The government of Russia promises 6.4 billion rubles by 2009 for the purpose. Replacement of the parent enterprise in the meantime may effect a year-long delay in contract fulfillment. And what will happen to the Tashkent factory? Boris Aleshin of Rosprom and Aleksei Fedorov of the United Aircraft Corporation signed a special protocol in Tashkent on November 21, 2006, where the latter declared its interest in continuation of cooperation and even mentioned the possibility that the Tashkent factory might join the Corporation one day. On the other hand, the United Aircraft Corporation is still in the process of formation. Now that the government has ordered IL-76 assembly in Ulianovsk, nobody is likely to become interested in the aircraft factory in Uzbekistan. In the meantime, experts say that it is still possible for the Tashkent factory to convert to modernization of old military transport planes. Moreover, the Tashkent factory may pool efforts with Ilyushin in design and production of new medium-range IL-114-300s. "The first IL-114-300 is to be built by the middle of 2007," Ilyushin General Director Victor Lifanov said. In the meantime, buyers are already lining up. Tekhnospetsstal Engineering of St.Petersburg has signed a contract for 30 planes of this type.